This feature is by Daniel Spicer, who blogs at Life Theses, as well as writes film reviews at Verbicide Magazine. The task was to base a Zelda timeline using James Rolfe’s Angry Video Game Nerd’s Chronologically Confused video as a starting point. He believes that Zelda II: The Adventure of Link never got a sequel, so that was our premise. 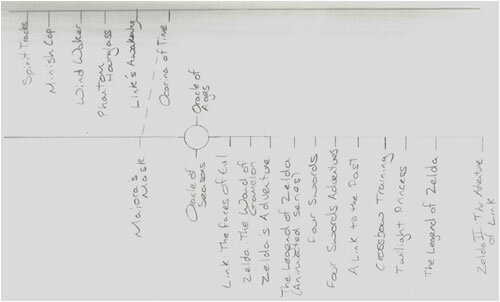 With the help of my good friend Sophie Smith we set about creating a Zelda timeline that didn’t rely on multiple identical characters to make sense of it all. Another rule we gave ourselves was that we didn’t want Ganon to be able to turn back into Ganondorf unless he’d been killed. If he’s just locked away then he can’t turn back into Ganondorf; to do that he has to die and be resurrected. We also ignored Skyward Sword, it’s not out yet so how could we know the ages of characters or anything else that might scupper our little space-time continuum. Bear in mind a few things though, firstly, there will be errors you can find with the timeline I’m sure. We haven’t played every Zelda game, so we did the best we could with the information we had, every Zelda timeline I’ve seen has errors in it, so ours will probably be no different. We’re also not pretending that the creators of the Zelda games knew what they were going to be doing fifteen games down the line, we put things where we felt they made most sense, regardless of the chronology of Zelda release dates. There will be spoilers, and most importantly, don’t take it too seriously guys, it may be one of the greatest game series of all time, but remember, there’s no need to start any World Wars about it. Now to offer some explanation. Spirit Tracks comes first, because Link is some kind of train engineer, he’s not wearing his normal green outfit at the start. Minish Cap is next, as in all the following games Link has his Cap with him, which he acquires in this game. Controversially we put Wind Waker next because Ganondorf is in this game, he never appears as Ganon, so we figure it has to come before Ocarina of Time (when we see the transformation). The stained glass window depicting Impa in Wind Waker merely shows that on this timeline Impa is important, but not that Link has encountered her yet. Phantom Hourglass does seem to be a direct sequel to Wind Waker so that’s why that comes next. Link’s Awakening is a tricky one for almost all Zelda fans. Without a Ganon(dorf) in this game to base the decision on, it can almost come anywhere (as well as the “it’s all a dream” excuse), but we figure that if the game starts with Link floating on driftwood in the middle of the ocean, he must have been on a ship before the game starts. What better place to put it then than directly after our pirate games: Wind Waker and Phantom Hourglass. Here’s where we make things up a bit, we’re assuming that the ship that Link, Tetra, and the other pirates were on has crashed between Phantom Hourglass and Link’s Awakening. I’m afraid you’ll have to forgive us embellishing the Zelda canon a bit here. Link then safely finds land for the next game to continue. Next of course is the most hellish game for all Zelda timelines: Ocarina of Time. Not because it’s problematic in itself, but because of the issues it causes other games in the series. Given that it’s Ganon’s first appearance we figure it should come before all of the other games which have Ganon in it. That’s why it comes next. Of course at the end of Ocarina of Time Link is sent back to experience his childhood. In this sequence we don’t see his horse Epona being sent back with him, but in Majora’s Mask Link has Epona. We assume that Link has been sent back onto a different timeline, one where Epona has existed but Ocarina of Time never happens. Again we must embellish and assume that Link has met Epona on this timeline and established a relationship just as strong as we saw in the other timeline. The Oracle games can be played in any order, but Ganon appears as a final enemy on the second play through of each game. Therefore they must come at some point after Ocarina of Time, assuming Ganondorf transformed into Ganon on this timeline at the same point in time as on the other one. Impa appears as a relatively young guardian in these games, so it must come before all the CD-I games where she is very old. That stained glass window causes some trouble, but we can assume that she has been revered for quite some time from a young age, enough at least to get a window of herself all that time ago. Her age is never stated, but imagine that the window was made when she was in her early twenties and she’s now forty in the Oracle games. There is a decent gap between the Oracle games and the CD-I games and the animated series in order for Impa to age. Many people discard these games and the TV show because they are horrifically bad, but they’re still part of the series, so we wanted to make them fit. These games set up a much closer relationship between Link and Zelda, and that’s continued in the Four Swords games. Four Swords Adventures goes on to tell a very similar story to that of A Link to the Past’s prologue. The difference being that in Four Swords Adventures, Ganon is locked away in the Four Sword. We then assume that the King of Hyrule and the seven wise men did not have faith in the Four Sword’s strength to imprison Ganon, so locked him away in the Golden Land/Dark World. A Link to the Past therefore follows with the prologue telling us about Ganon and the Triforce, but not telling us about the events of the original NES games. Therefore it must naturally be considered a prequel to them. Crossbow Training follows, that game can go anywhere, but Link seems relatively grown up in it, and it looks like the world in Twilight Princess so we popped it just before where Twilight Princess appears. Ganondorf is in Twilight Princess: he travels between the Twilight Realm and Hyrule, we figure this all happens in one block and doesn’t span any other games. Ganon from A Link to the Past was therefore killed at the end by Link and has somehow been resurrected as Ganondorf for this game. Unfortunately it has to be awkward like this because Link is considerably more grown up than any other game where Ganondorf appears. Finally the NES games come because they don’t appear in A Link to the Past’s prologue and at last we’re at the end. As I said I’m sure many of you will find fault with this, but it was an enjoyable if exceedingly difficult exercise, and we feel like we’ve come up with a simplified solution to the Zelda timeline which can hopefully be improved upon. Please do take it and add to it, and if you can find a way of making the Smash Bros. games make sense then you’re a better person than I.